Also nokitomoe 軒巴, *nokidomoegawara 軒巴瓦. A very old expression for tomoegawara was *tsutsumigawara 包み瓦. A half-cylindrical tile with a circular disk attached *nokimarugawara 軒丸瓦. The name of this tile is derived from the disk, which is decorated with a comma pattern *tomoemon 巴文. 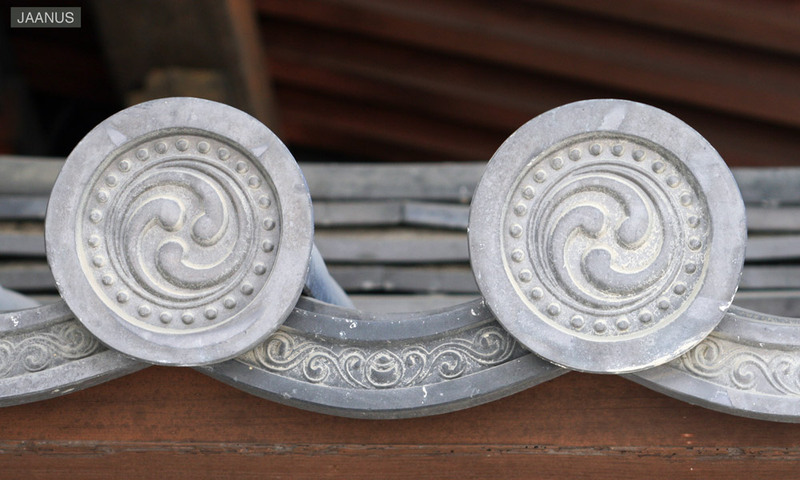 Tomoegawara are used at the eave edge and also along the eaves that overhang the bargeboard *hafu 破風 of a hip-and-gable roof or gable roof *irimoya-zukuri 入母屋造. When placed in the latter position they the are called kakedomoegawara 掛巴瓦.